On the base of Taiji Tuishou (Pushing Hands), Wushu Tuishou is a kind of civilized athleticisms, in which the competitors make efforts to have the opponent fall down to the ground for losing of balance. On the principles of Touch, Join, Stick , Follow and "no hit with separated hands", the competitors utilize the hand techniques, such as Lu (roll back), Ji (squeeze), An (press), Cuo (scrub), Dai (lead), and the leg techniques, such as, Bie (clip ), Gou (hook), Ban (stumble), Gua (hang). Thus, Wushu Tuishou is also called civilized Sanshou (free fighting). 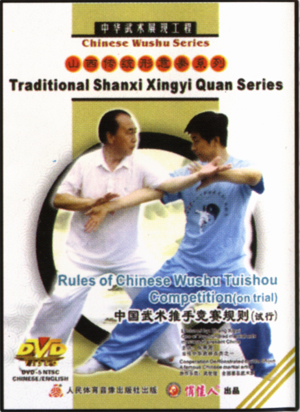 The rules for the competition showing on this disk are explained by Zhang Xi-gui, one of the prominent martial artists, and demonstrated by Wu Shi-jun and Liu Jun. Wu is a famous Chinese martial artist, and Liu is one of the champions of China Wushu Championships. This disk provides the competitors and judges of Tuishou with an excellent learning material which gives a detail account of allowed techniques, prohibited parts and scoring criteria of the competition.